The matrix is the framework that creates the structure for the LSC wall system. The EcoNest matrix system uses modified Larsen Trusses, each made with a pair of 2x4s joined with plywood gussets. When used in conjunction with a load bearing timber frame, trusses may be placed at 32” intervals. When used as the load bearing wall the Larsen Trusses must be spaced at a maximum of 24” intervals. · Creates straight and stable deep wall trusses saving on wood use. · Reduces infiltration and thermal bridging. · Creates wall cavities that are easily loaded and tamped. Efficient, uniform, professional results can be achieved even by novice carpenters, by using the following tried and true step-by-step procedure. 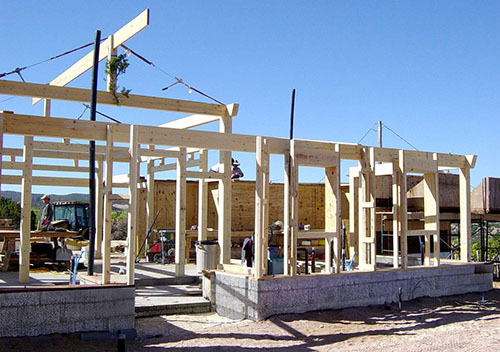 Straight Larsen trusses are the primary matrix component. To achieve consistency and efficiency we first build a jig. 1. 1. Create the base screwing two layers of ¾” plywood together measuring 12” wide x height of desired truss. We typically make the jigs 96” tall. 2. 2. To this base attach a spine consisting of 2-layers of ¾” x 5” plywood (or other stable sheetgoods) down the center of the base for its entire length. This serves as a spacer for the two studs. 3. 3. Screw gusset stops to the spine, per diagram below for accurate placement of plywood gussets. Note the bottom gusset stop is placed so that the bottom of the first gusset is located 1” from the bottom of the studs. This allows space for electrical wiring to pass under this gusset. Electricians love this thoughtful detail which eliminates the work of drilling passageways for wiring. 4. 4. Screw a plywood foot to the bottom end of the jig per diagram below for accurate bottom alignment of studs. 3. 3. 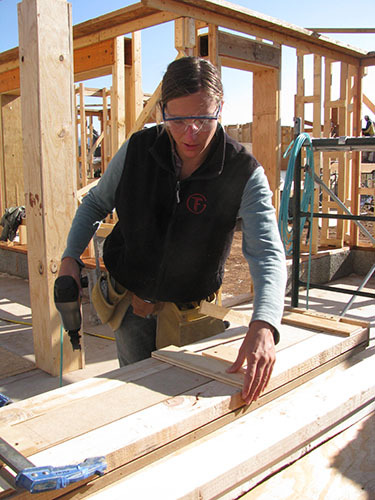 For maximum efficiency a pneumatic staple gun is used for fastening the gussets to studs. 4. 4. Load jig with two studs aligned with bottom foot. 5. 5. Fasten the gussets with 3 staples/fasteners per connection. 6. 6. Label the top gusset to ensure that Larsen trusses are installed right side up. Student fabricating a Larsen truss in the jig. The Larsen truss was created by John Larsen, a builder in Edmonton Alberta in 1981. It uses small dimension framing members joined with plywood gussets to build thick insulated walls for the purpose of energy efficiency.